Guatemala City is often a traveler’s first glimpse of Guatemala. As your plane descends over the capital, you witness the largest city in Central America unfold—a sprawling, colorful metropolis that spreads into a valley ringed by forested mountains and volcanoes. It’s a big and powerful place that is home to around four million people. The nation’s capital is a bustling urban center that spills across a wide valley into the surrounding hillsides and ravines. It’s pretty from above, but the city itself can feel chaotic and polluted. At times it’s chock-full of people and cars and seems architecturally uninspired. Even so, Guatemala City, or “Guate” as locals know it, does have some redeeming features. The climate is pleasant and the backdrop is scenic. There are also some wonderful museums, restaurants, and entertainment options here. Whether for a night or a few days, Guatemala City will likely have a place on your itinerary. Get to know it. 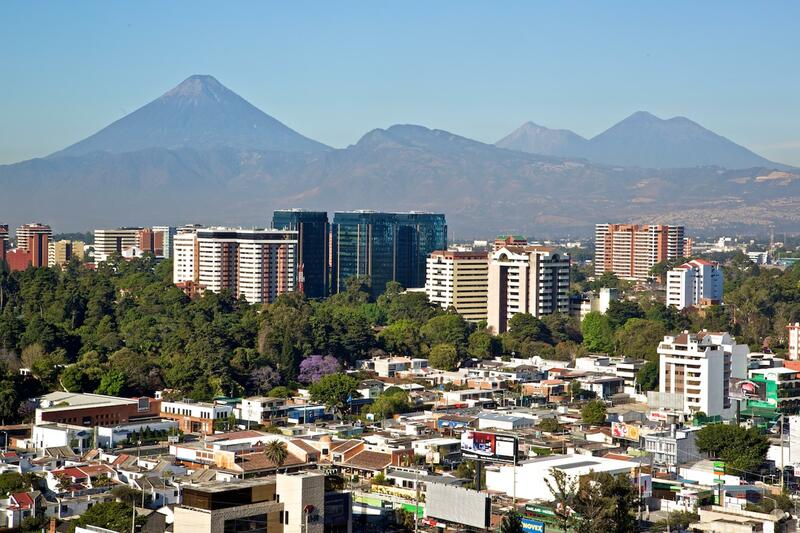 Guatemala City is located in the Central Highlands some 28 miles (45 km) east of La Antigua. Set within a valley at an elevation of 4,897 feet (1,493 m), the climate here is pleasant year round—it usually doesn’t get too hot and the evenings are jacket-weather cool. That said, the city can experience hotter periods, especially when the sun hits the pavement and heats up the surrounding air. That can happen in April and May, with daytime highs reaching into the upper 80s. This is also the driest time of year. During the rainy season, which usually hits hardest between June and August, the mornings are clear and warm and the afternoons are cloudy and rainy. September and October are typically wetter and cloudier. Things clear up in November, and from December through February it can get downright chilly. Guatemala City is the fourth capital of Guatemala. Earthquakes, mudslides, or the arrival of the Spanish destroyed the previous three. The land where Guatemala City now sits was once occupied by the Mayan city Kaminaljuyú, which was settled around 400 BC. During the Classic Mayan period, Kaminaljuyú was allied with the powerful city of Teotihuacán in Central Mexico and had important influence over trade routes. At its peak, Kaminaljuyú had a population around 50,000. It eventually fell into decline around 600 AD and by 700 AD was abandoned. The city’s current settlement is a result of the 1773 earthquakes, which hit the former capital of La Antigua. The Spanish decided to build a new city rather than rebuild the old one, and moved the capital into the neighboring valley, some 28 miles (45 km) east. Despite Spanish decrees ordering the settlement of the new city, many residents refused to leave Antigua. The current capital was officially settled in 1776, but by 1800 the population of Guatemala City was only 25,000. Another factor slowing the city’s growth was the competition – both in size and importance – from the large urban center of Quetzaltenango. In 1902, however, an earthquake left Quetzaltenango in ruins and effectively solved the problem—many wealthy families moved to Guatemala City and helped establish it as the country’s main city. Guatemala City, however, experienced its own series of destructive earthquakes in 1917 and again in 1976. Even so, the city grew considerably during the 20th century, especially during the 1970s and 80s when refugees fleeing the civil war raging in the countryside migrated into the city. As the city grew it expanded into the surrounding ravines and mountains and morphed into new neighborhoods. The city is still growing as more and more migrants move here to find economic opportunity. These days, the metro area of Guatemala City has a population around three million. Guatemala City is divided into 21 zonas (zones). Only a few of these will be of any interest to visitors—downtown falls into Zonas 1 and 2, while the newer sections of the city are in Zonas 4, 9, 10, and 11. The city’s international airport is in Zona 13. Zonas 14, 15, and 16 are the stomping grounds of the city’s elite and host many hotels, restaurants, and malls. Most of the city’s historic sites are found within the Centro Histórico in Zona 1. This is the original center of Guatemala City. Although few of the original buildings still stand – most were destroyed in the earthquakes of 1917 and 1976 – there are still places where you can see the original neoclassical architecture. Restoration is underway to rescue and restore many of the historic downtown buildings. The former presidential palace, Palacio Nacional de la Cultura, is one of the city’s most compelling attractions. Built between 1939 and 1943 under dictator Jorge Ubico, this massive green stone structure has elements of colonial and neoclassical architecture. Although it hasn’t housed a sitting president since the early 1990s, it provides a good look into Guatemala City’s colonial and dictatorial past. The 1996 peace accords were signed here and it was made into a museum. Free guided tours are now offered. Catedral Metropolitana was built between 1782 and 1815. Incredibly, the cathedral has survived two earthquakes. It’s worth a look if you’re in the area—the names of many of Guatemala’s disappeared (people killed during the civil war) are etched into the pillars on the front of the church. Several other churches in this area have been restored and retain noteworthy architecture. These include Iglesia Santo Domingo, Iglesia de San Francisco, Iglesia San Miguel de Capuchinas, and El Cerrito del Carmen. Zona 4 was revitalized in recent years. There is now a pedestrian walkway, 4 Grados Norte, which is lined with stylish cafés, restaurants, and bars. This area is likely to keep growing in the coming years. Guatemala City has a wide range of accommodations. There are hotels scattered throughout most of the zones, with something for every budget. Many of the major U.S. hotel chains are closer to the airport in Zonas 10, 11, and 13. Some of the most economical options are downtown. Guatemala City is a big, cosmopolitan city and features a variety of excellent restaurants. There are all kinds of cafés in the downtown area. Italian, Mexican, Mediterranean, and Guatemalan restaurants are scattered around the city. French, Asian, and fusion cuisine is particularly popular here. The city has a fairly lively nightlife. There are a nice variety of bars in the downtown area that cater to international travelers and more bohemian-minded locals. Grado Norte in Zona 4 is becoming increasingly popular with its bars and restaurants lining a pesestrian walkway. Zona Viva, in Zona 10, has trendy bars that typically serve the city’s elite. If you want to go clubbing there are a few options, and there are several spots to see live music as well. Guatemala City has excellent shopping options. There are large malls that carry all kinds of items and chic boutiques where you can buy trendy getups. The stalls in the downtown area are the place for textiles, leather goods, jewelry, and other handicrafts. Zona Viva features attractive retail outlets where you can window-shop and search for outfits. "Very safe area. Not very many tourist but we were happy with the location. A lot of nice restaurants. The area is most for business travelers." Very safe area. Not very many tourist but we were happy with the location. A lot of nice restaurants. The area is most for business travelers. Great service & beautiful country. Thank you! I absolutely LOVED Guatemala. The people were so welcoming and warm and SO grateful for our visit. Their tourism is suffering due to media stating the country is not safe and/or is still a mess from the recent volcano eruption. I found none of this to be true! I felt 100% safe in every area I visited at all hours. 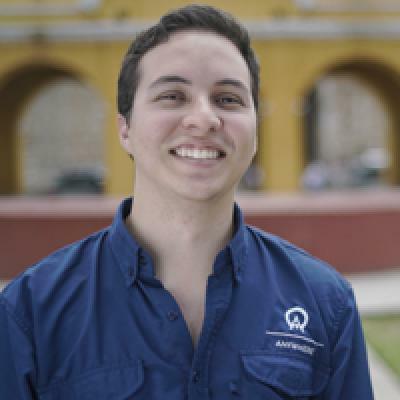 Guatemala needs our support and our tourism. I hope to return soon to help support these wonderful people in this amazing and beautiful country. This was a wonderful trip and the experience exceeded our expectations. Bitty and her team were both caring and professional. I look forward to our next visit.